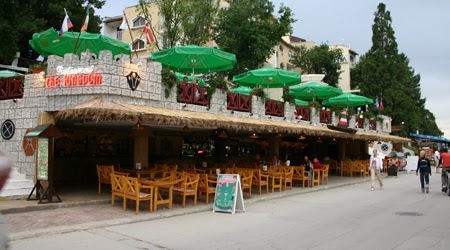 As Bulgaria's second largest summer beach resort, Golden Sands on the northern Black Sea coast boasts all of the same amenities as its southern counterpart, Sunny Beach, but is perhaps set in a more relaxed, less busy environment. Situated approximately 25 kilometres from Varna airport, the short transfer from the airport will bring you to the doorstep of one of the most beautiful beaches in Eastern Europe, with over 3 kilometres of Blue Flag pure gold and white sandy beach, there certainly is plenty of space to relax, sunbathe and try out some of the fantastic water sports on offer. Mainly attracting families and couples, the resort has become extremely popular with British guests over the last 5 years, firmly securing its position as Bulgaria's second busiest summer resort. Besides the spectacular beach that rivals its larger European counterparts, Golden Sands proudly offers a wide variety of water sports from parasailing to banana boats, jet ski's and pedaloes, to suit every taste. There is also a bustling market place where you can buy anything from local meats and produce, to clothing, hand-made crafts and souvenirs. End your day by taking a stroll in the evening when the resort comes alive with street performers showcasing their skills outside the many bars and restaurants that line the promenade all offering various offers and amazing deals. 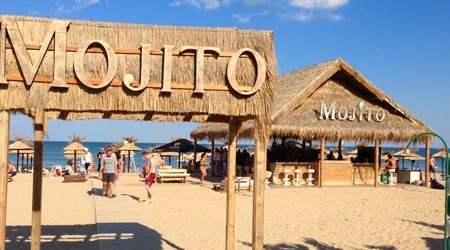 Definitely not to be missed are the beach front bars, during the day these little taverna style eateries are the perfect place to escape the sun and grab a quick bite to eat or drink. On the menu are usually bbq foods, chips, salads, local cuisine and of course, ice cream to keep you cool. As the sun sets over the resort, many of these beach bars become a hot spot for those who want to have a fun night out without heading to the main strip of bars and restaurants. In the resort you will also find bowling alleys, tennis courts, spa and massage facilities, volleyball courts, basketball courts, horse riding and even an amazing water park, perfect for kids, big and small! The Aquapolis water park is ideal if you are a fan of high action, adrenaline filled water slides and rides. Divided into 3 areas, for adults, for children and the extreme zone. This certainly is a trip you will need a whole day set aside for! If you fancy something adventurous without getting soaked, then be sure to try the Jeep safari excursion. This "outback adventure" is an amazing opportunity to experience local culture and see some "off the beaten track" sights. For those who fancy adding a splash of culture to their holiday, a stunning day trip to the historic city of Varna is on offer too. Classed as Bulgaria's "Sea Capital" due to its proximity to the ocean, the ancient city of Varna dates back to 1000 BCE, making it one of the earliest settlements in Europe! This stunning city is home to the world record for "Oldest Golden Treasure in the World" which was discovered in the Varna Necropolis and dates back to 4,750 BC. The city is also home to an array of ancient Churches, Cathedrals and Museums as well as Galleries, Theatres, Opera Houses which host a plethora of festivals and events throughout the year. Varna also has one of the best shopping districts in the country, with its streets filled with luxurious designer brands, local markets, vendors and eateries. With temperatures in the Golden Sands peaking at around 30 degrees in the summer, it is no wonder why every year thousands of people flock to the resort for a much deserved break. Make Golden Sands your little piece of heaven this summer with Balkan Holidays offering flights to Varna from 5 UK airports and a further 3 flights to Bourgas with transfers to the resort of Golden Sands. Balkan Holidays are proud to offer an impressive selection of hotels within the resort, catering for most holidaymakers needs. So whether you are travelling on a budget or fancy something extraordinary, there is a summer holiday to Golden Sands waiting for you in 2014.